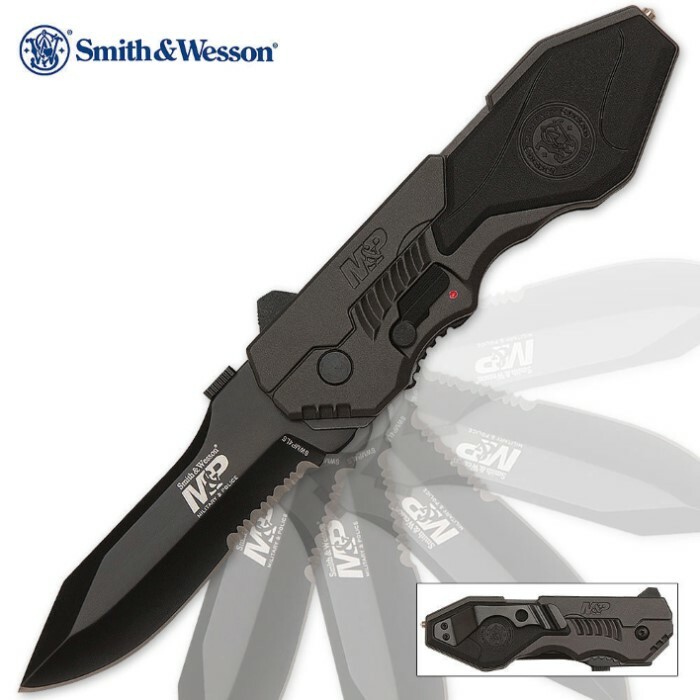 Smith & Wesson M&P Assisted Opening MP4L Tactical Pocket Knife - Partially Serrated | BUDK.com - Knives & Swords At The Lowest Prices! 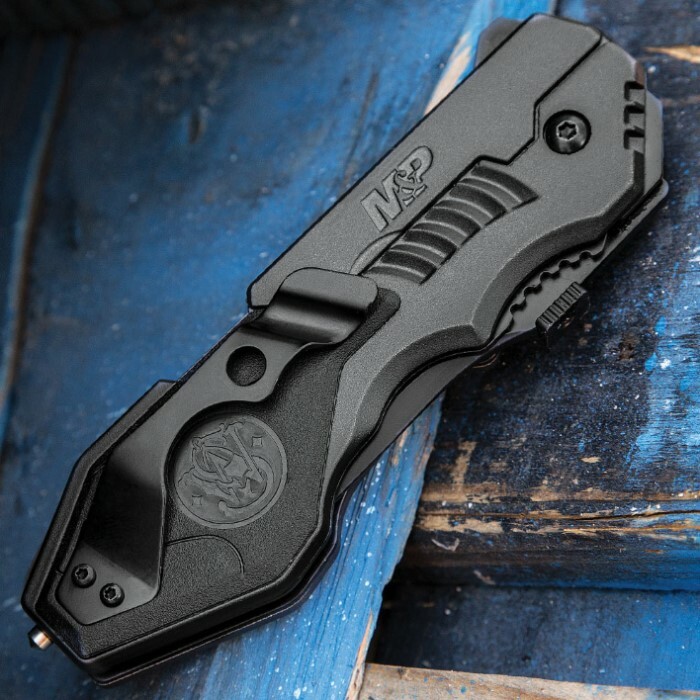 You won't be able to beat this Smith & Wesson M&P folding pocket knife, equipped with a 3 1/2" modified clip point blade constructed of 4034 stainless steel with a partially serrated edge. Built with a sliding safety release, you can engage the rapid release M.A.G.I.C. assisted opening mechanism with the thumb stud and put this serrated pocket knife to work. After about a month of use the open assist broke and the blade would no longer stay open, but before it broke it was a great knife. Very sharp! Great design! Fits great in your hand! Assisted opening does its job quickly! All around great knife! It's a great knife it's built tough easy to open love the thumb lock all around its a great pocket knife I would recommend it to anyone. Very sturdy strong knife but holds an edge like bulls**t. Thanks to the serrations you can really get it through anything. I've tried sharpening it so many times that I gave up. If it could hold an edge or was made of a better steel the 4034 I would say this knife is perfect. It's very strong though I use it for prying stuff and real grunt work now. This knife is a solid, well built piece of work. Good steel blade that is very sharp. This knife works very, very well and is like a tank. I highly recommend this quality weapon and I will carry mine at all times. The only negative at all is the clip which I would have liked to have seen it be a bit heavier and sturdier. Overall, this knife is easily a "must have and must carry". This Smith and Wesson MP4L is awesome! The assisted opening is amazing and never quits. The glass breaking tip is kinda useless,and pretty small, I don't think it will work well. in other words, don't buy it for the glass breaker. I find it a little hard to close, but I've never had any problems with it. The knife has a pretty good weight that I like. The knife feels durable. The safety works well, and keeps the blade closed when on. I like assisted opening knives that have a safety so you know it wont open in your pocket. This one never will! The MP4L was amazing! Very well made easy to use knife. The safety is a great feature. The only knife you will ever need to buy, plus it has a life time warranty! This is the best knife BudK sells. It has a nice weight to it, which I like. The assisted opening has never been a problem, and opens at the same speed every time. It comes sharp, but I still sharpened it.The blade is remarkably durable, and after a few weeks still hasn't gotten any less sturdy. And it is my favorite brand Smith and Wesson, how can you go wrong with that? 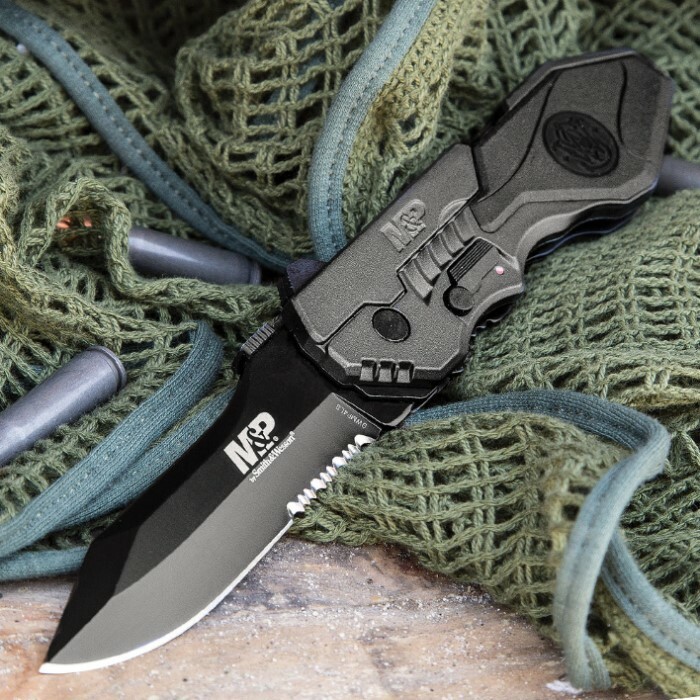 I'VE PURCHASED MANY VERSIONS OF THIS KNIFE AND SUPPLY THEM TO MY LAW ENFORCEMENT CO-WORKERS. SO FAR, EVERYONE IS VERY SATISFIED WITH THE QUALITY OF THESE KNIVES. THE SAFETY LOCK IS INVALUABLE AND THE ASSISTED OPEN MAKES USE A BREEZE! MY EXPERIENCE IS THAT THE KNIVES COME OUT OF THE BOX EXCEPTIONALLY SHARP. HAVEN'T HAD ANY ISSUES WITH SHARPENING. YOU'LL LIKE THIS KNIFE!